Getting excited for the ride!!! My trailer may not be ready....however, I can still haul at least one additional bike in my truck or pull someone else's trailer. Kendall - look forward to hearing the Colorado stories. Hate to see you and your wife sit the Arkansas ride out. Maybe just stay one night vs. 2?? HanesAnizer wrote: Getting excited for the ride!!! My trailer may not be ready....however, I can still haul at least one additional bike in my truck or pull someone else's trailer. I've got a solid, 3 rail trailer but not the vehicle to pull it fully loaded. 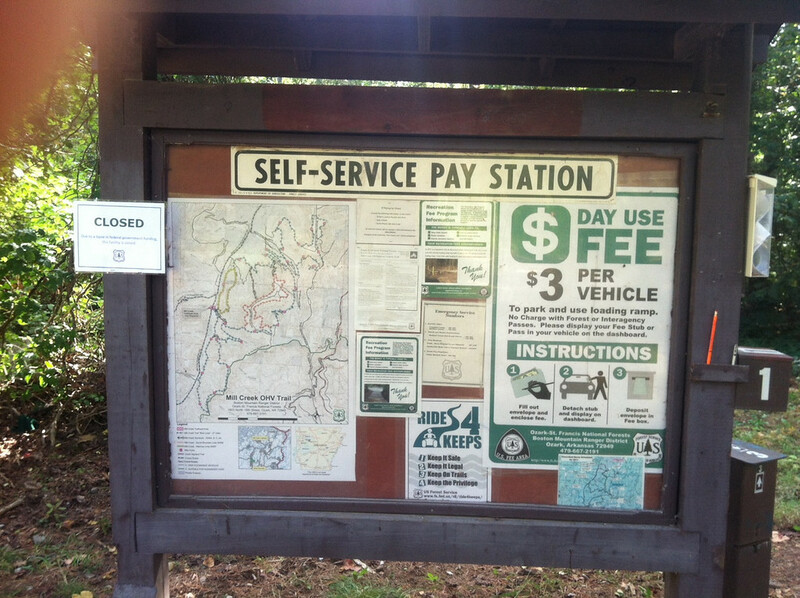 Our FRI route cuts through the Mill Creek OHV trail system....which is now closed thanks to the gov shutdown. BUT...according to this, all roads and trails are OPEN. USFS wrote: Due to the lapse in federal government funding, the U.S. Forest Service, as with other federal agencies, is closed with the exception of certain essential services. Please note, DISPERSED RECREATION IS PERMITTED and ALL OPEN ROADS and TRAILS, EXCEPT ROUTINE SEASONAL CLOSED ROADS, WILL REMAIN OPEN. All rules regarding hunting and motor vehicle use remain in effect. No worries. We will not enter or exit at an official entry point. I'm pretty sure those trails will do just fine without any government funding or USFS management. My money says the gov is "back in biz" by end of next week anyway. Sounds good to me. Mine has a suspect bearing/hub and I don't know I'll have time to fix it in time. Well let's hope the Gov is back up and running by then, but if not, no one is there to police it so we should be good. Randy & I have completed the 3 day plan. NOTE: This is a GPX data file intended to be imported into programs such as Garmin's Basecamp or MapSource. It should be compatible with most GPS software and devices. It contains 9 tracks and 28 waypoints. If your device needs routes instead of tracks, Basecamp can turn tracks into routes with a button click. Also note that an alarming number of GPS devices simply can't load tracks (like many NUVi models) and some can't load "multi-point" routes--that is, they only do "smart routing"--which means this data will be useless to you. If you have a track-compatible GPS, great--load this data. If not, no worries! Just follow the leader! Did everyone call to book their Clarksville room for Fri & Sat nights? Sean & I booked a room. I know Randy booked his. I'm slowly but surely whipping my KTM 450 EXC into shape for the ride. Replaced the leaky countershaft seal yesterday. Also discovered I need a new battery as my old one will barely turn the bike over and will not take a charge. Don't do what I normally do and wait until the last day to get the bike ready! Go make sure that thing will start while you still have time to get a new battery, etc! Anyone want a 2012 KTM 350 EXC? (FACTORY STREET LEGAL, EFI) I'm probably selling mine. When I get her cleaned up, I'll post her in the classifieds along side Larry's 250. His 250 is in even better shape than my 350.
troy wrote: Anyone want a 2012 KTM 350 EXC? (FACTORY STREET LEGAL, EFI) I'm probably selling mine. When I get her cleaned up, I'll post her in the classifieds along side Larry's 250. His 250 is in even better shape than my 350. I have been looking for a WR250R but maybe interested. Drop me some info on it please. Troy, I'm not able to import your tracks into MapSource. I open the page and can read the code, but can't find any options to download or import it. I even updated my Mapsource, but still couldn't find it. I know I've downloaded tracks and routes before, but can't seem to get it to work now. Any suggestions, or should I just bring my computer and GPS tomorrow? Also, I've got room in my truck / trailer for two more riders / bikes. So if someone is looking for a way to carpool, let me know. rycomm wrote: Troy, I'm not able to import your tracks into MapSource. I open the page and can read the code, but can't find any options to download or import it. I even updated my Mapsource, but still couldn't find it. Troy knows a lot more than I do about downloading tracks, but are there situations where a track created using basecamp will not download into mapsource? Looking forward to the Friday ride!! I'll be out the rest of the weekend staffing and catering will keep me out for Saturday and Sunday. Rusty Jug wrote: Looking forward to the Friday ride!! Sounds good....see you Friday morning. Don't forget your riding boots! I know nothing of importing tracks to Mapsource or what a GPX file is but I do know that I wish I were riding with you guys this weekend and I know that I couldn't ride at Randolph this past weekend because of the shutdown and I know that I want to be on the list of potential buyers for a 2012 EXC 350. That is what i do and don't know. Rick. Won't forget my boots! That one time changed me for life! Will anybody have a 2 way Sena head set on for Friday? Trying to decide which helmet to bring, one with music or old school motocross that can be beat around on trees. Rusty Jug wrote: Won't forget my boots! That one time changed me for life! To each his own of course, but Friday's route will be gnarly. You will be working hard and stopping often. Some folks will possibly be picking up their bikes a lot (me). Highs are now forecast to be about 80, so sounds like we'll be hot. Motocross style helmet may be preferred. There is now a 30% chance of rain Sat & Sun for Clarksville...still lots of time for the forecast to move. Right click on link, save as, then open once downloaded. Worked for me with MapSource. Ok, Troy, I punched the street view and I only see trees with no entrance on my iPhone I like being difficult! Rusty Jug wrote: Ok, Troy, I punched the street view and I only see trees with no entrance on my iPhone I like being difficult! RJ, I don't know how to make it easier beyond coming over and holding your hand through the process! You load that Gmap link (1st post) and then Street View the point B, which is Fort Rock. How about this...I'll take a screenshot of the Street View from my screen and display it here! Here is what the entrance to Fort Rock Family Camp looks like. Note, it is a rough, steep driveway with a switchback. If you are pulling a trailer, I hope it's not a big one. Once you get up the hill, you'll see the fort--you'll know you are in the right place! As you pull up to the fort, turn right and drive around the right side of the fort to park. So far that's zero folks for the zipline. I don't how many of you have been zip-lining before, but $15 is the BEST DEAL you will ever see for a professional zipline. Let me know if you want to hit the line. I don't know why it wouldn't work yesterday, but I tried it today from my other computer and it worked just fine. See everyone in a bit.